What? Rescue who? But I’m only seven!’ After falling asleep in her mother’s car Annie suddenly finds herself in the strange but beautiful land of the fairies, where the King and Queen desperately need her help. 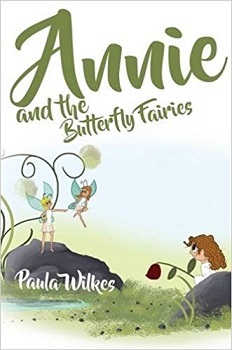 Humans, who do not believe in fairies and can only see them as butterflies, have captured their daughter Princess Erin, and it is up to Annie to come to her rescue. She is accompanied on her exciting journey by friends both old and new. Can this be real, or is Annie only dreaming it? A touching adventure in the tradition of The Wizard of Oz, Annie and the Butterfly Fairies shows a young girl learning responsibility and helping others using the inner strength she never knew she had. Annie and her mum were travelling home from a birthday party when out of nowhere a red truck crashed into them, knocking Annie out. When Annie awoke she found herself in the middle of a forest all alone. That was until she heard two voices talking to her, but there was no one around. One of the voices then realised that she couldn’t see them, and said ‘By the power of the sun, let this human into our world’. Magically appearing in front of Annie were two fairies. The fairies explained that they had been waiting for Annie as they needed her help to save the baby princess Erin who had been captured. Annie couldn’t believe what she was seeing, nor hearing. Was this real, or was she dreaming? Annie and the Butterfly Fairies is a short, small-sized, children’s fairytale-esq book, split into seven chapters. The story is filled with magical moments, and includes some very well known story book characters, such as The Old Woman who lived in a Shoe, and The Fairy Godmothers. This book also includes lots of beautiful, colourful illustrations that brighten up the book, and really do emphasise the story. There is a lot of text in the book, which may make it quite hard for some younger readers, but I’m sure with the help of a teacher, parent, guardian, this story can be enjoyed by those that are both confident and new readers. A very sweet book that will be enjoyed, especially, by those children who love fairytales, and fairies.